Today was a great day out for Alan and Trustee Baz Gray as they paid a very special visit to the Royal Navy Recovery Centre (Hasler Company) HMS DRAKE set within the Plymouth Dockyard. Hasler Company has been the custodian of one of the Batons since the very early days and the first organisation to permanently hold one on a full time basis. It has been some time since Alan has visited Hasler so today was made all the more unique and pleasurable as it was Hasler who requestedthe visit in order re-invigorate the Batons message and get an update on the charity’s work to date. The reason for this new inspired drive to support the Baton was the recent Frankton 75 Expedition, re-creating the journey taken by the Cockleshell heroes in 1942. The Baton was an integral part of that re-enactment, becoming a much loved and sought after item on a daily basis by all those involved. As many of you know and for those of you that don’t, we now have a copy of the “Message” and “The Baton Poem” printed on parachute silk inside all of the Batons. 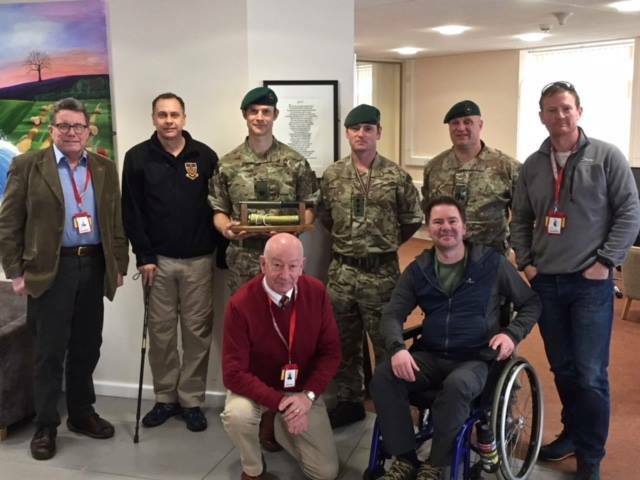 The last Baton to receive them was the Hasler Baton and it was a huge honour for the Baton family to invite Lt Col Nick Griffiths RM and WO2 Nick Raine RM to do the deed and seal the two silks inside the Baton. It was a fantastic day and a great opportunity to spend time in such a professional and humble unit. Huge thanks to Capt Paul Fleet and Major Simon Tucker (OC Hasler Company) for hosting us and continuing to keep the message alive through all they do at Hasler. It is safe to say we will be seeing much from them including their participation in the 10th Baton Memorial run 9-10 June 2018 which we are delighted about.